Gladstone Commercial Corp. is a diversified commercial property REIT. The real estate investment company has a large, growing property portfolio and retains considerable expansion potential. The REIT covers its payout with (core) FFO, but has a narrow margin of dividend safety. Shares are sensibly valued on a run-rate FFO basis. An investment in GOOD yields 7.1 percent. 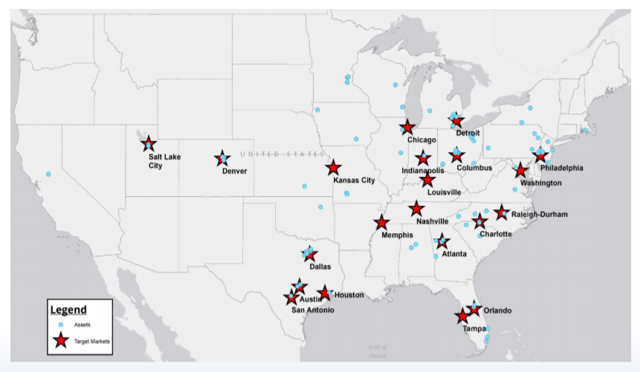 Gladstone Commercial Corp. (GOOD) is an interesting net lease commercial property REIT in the United States that produces high, recurring dividend income for its shareholders. The real estate investment trust has a large, diversified property portfolio and has grown its portfolio and associated revenues at a fast clip during the current economic upswing. 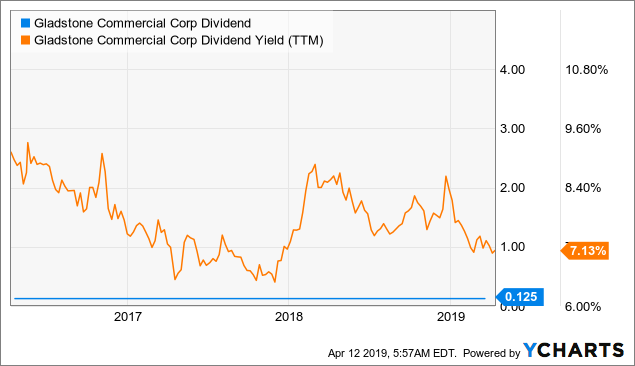 Gladstone Commercial Corp. covers its dividend with (core) funds from operations and pays its dividend on a monthly basis. Shares are moderately valued and throw off a 7.1 percent dividend. Gladstone Commercial Corp. is a commercial property real estate investment trust with an equity value of ~$632 million. The net lease REIT invests largely in industrial and office properties that produce recurring lease income for the company and its shareholders. At the end of the December quarter, Gladstone's real estate portfolio was comprised of 101 properties reflecting 11.7 million square feet. 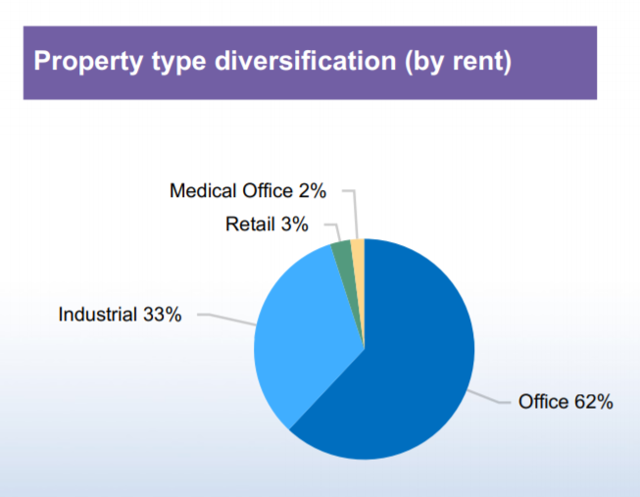 Office properties account for the lion's share of Gladstone's property portfolio (62 percent) while industrial properties represent 33 percent of rental income. Here's a portfolio split by property type. Gladstone has significant expansion potential as the REIT's properties are currently only represented in 24 U.S. states. The REIT has aggressively invested in office and industrial properties in the last decade in order to develop a national real estate platform and grow its funds from operations. Management has invested an average of $88.6 million each year since 2010 into the acquisition of new, income-producing commercial properties. Gladstone's rental revenues have increased 45 percent since 2014 and reached a record of $106.8 million in 2018, thanks to the REIT's hunger for commercial property acquisitions. 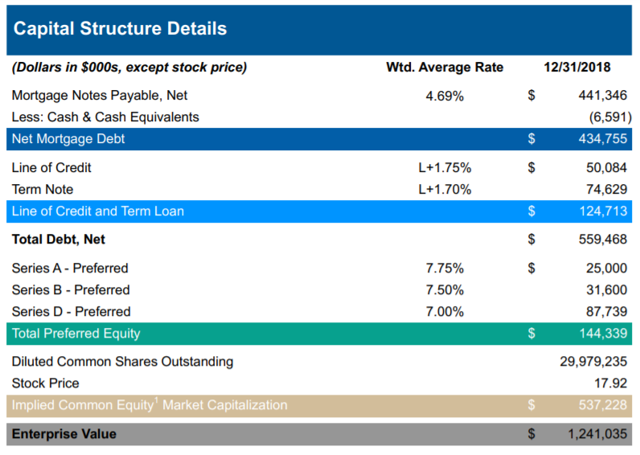 About 55 percent of the REIT's capitalization is made up of common and preferred equity while the remainder is made up of net mortgage debt and credit lines/term loans. 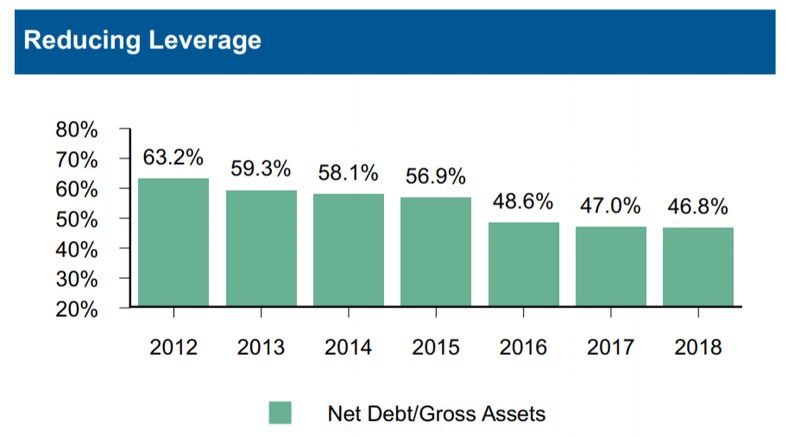 Gladstone Commercial Corp.'s total net debt at the end of the December quarter stood at $559 million, or ~45 percent of enterprise value. The leverage ratio - as measured by its net-debt-to-gross-asset ratio - has consistently trended down in the last several years as management made the REIT's de-leveraging a priority. Gladstone covered its dividend payout with both funds from operations and core funds from operations in each of the last five quarters, but the margin of dividend safety is narrow. 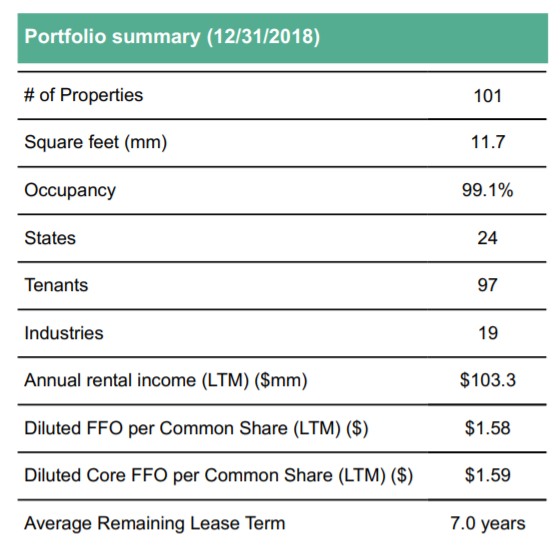 The REIT earned an average of $0.39/share in FFO and core FFO on average in the last five quarters compared to an unchanged dividend payout of $0.375/share. The dividend coverage ratio averaged 105 percent. Gladstone pays a monthly dividend of $0.125/share (total annual dividend payout of $1.50/share), which means investors buying today get a 7.1 percent dividend yield. The REIT does not grow its monthly distribution. Gladstone's dividend stream currently costs high-yield investors ~13.5x Q4-2018 run-rate core FFO, which is a sensible FFO multiple, in my opinion. 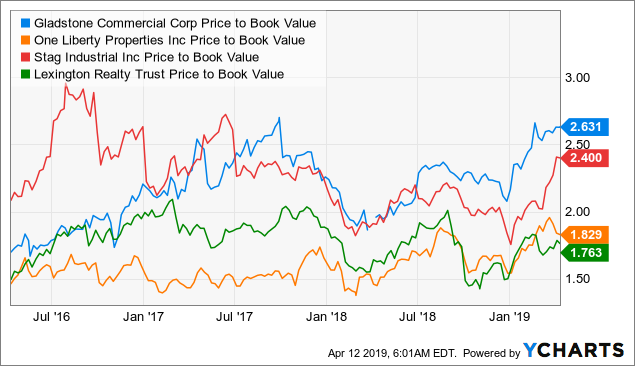 In terms of price-to-book-value ratio, GOOD is the most expensive company in its peer group of commercial property REITs. Gladstone Commercial Corp. has large investments in offices and industrial properties which tend to have shorter lease terms than apartment and many retail REITs. As a result, it has higher cash flow and dividend risks than other REITs in the event of a major economic downturn. A recession is the single biggest risk factor investors have to account for as decreasing cash flow could put pressure on the REIT's distribution. Gladstone is a promising yet cyclical office-and-industrial REIT play for income investors that seek high, recurring dividend income. The investment thesis, however, hinges on a robustly growing U.S. economy as a recession would most likely hurt the REIT's revenue and earnings stream, and the dividend has a higher-than-average risk of getting cut during a downturn, in my opinion. The REIT is moderately diversified and covers its dividend payout with funds from operations, though the margin of dividend safety is thin. Gladstone Commercial Corp. is not yet overvalued, based on run-rate FFO. Speculative Buy for income and capital appreciation.